All K6FB repeaters and packet stations are open; that is to say, any amateur radio operator can use the repeaters or digipeaters. Repeater control codes are limited to club members. Learn more about our repeater sites. The 2m and 440 frequencies are linked full time. When using this linked system ensure that you pause a moment after keying the microphone before speaking. This allows the radio links to open between the two sites. The 220 repeater can be linked at the discretion of a control operator. Las Cumbres members have also purchased a remote base system that links the repeater system to steerable output frequencies on other bands. Members have access to the control codes to use the remote bases; are you a member? Our flagship repeater site (at left) is located near Castle Rock State Park along Skyline Road (Hwy 35) west of Los Gatos. From this high level vantage point at approximately 2800 feet, K6FB has an extensive RF footprint "from the Sierra to the Sea". The shack pictured here was built by LCARC members beginning in August 1991 as a club project. It replaced a dilapidated structure that was on site. The replacement shack was built to withstand the rigors of earthquakes, wind, rain, cold, and occasionally, snow! These are typical environmental conditions for this mountain top location. 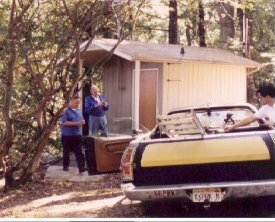 Beyond the radios, the shack features a built-in work table, storage cabinets with a stock of hardware and electronic parts (the closest hardware store is a 1 hour round trip away), skylight, and wheelchair access ramp. The 2-meter repeater is located at this site. A Vertex rig handles transmit and receive duties. The Stationmaster antenna is atop a 110 foot pine tree that overlooks both sides of the Santa Cruz mountains. This repeater offers coverage past King City and Monterey to the south, to the Sierra Nevada mountains and foothills on the east, and reaches in to most areas of the north bay and regional coastal waters. A pair of Yagi antennas mounted on the shack provide link radio service to our Black Mountain site, about 12 miles distant. Through this linked system a single repeater controller can do double duty serving both our 2m and 70cm users. The 1.25m repeater is also based at the Castle Rock site. Its antenna is located atop an 80 foot pine tree. This repeater is a stand-alone machine; it isn't linked to the 2m or 70cm machines. The 220 system has coverage similar to the 2m repeater. The obsolete controller for this repeater was entirely replaced mid-1997. The Castle Rock shack once had a substantial 12V battery back up system. The batteries were capable of supporting operations for more than a week without AC power. Our club old timers vouch that this has been tested more than once! You can see the battery case and charging system at the back of the photo, behind the racks. The charging system had two phases: one that charges the system at a high rate after AC mains have been down for an extended period, and a second system that maintained the charge, ensuring that the system is always ready to go. This site is now powered by an autostart generator. This was funded jointly by LCARC and our mountain-top landlord in 1995. On one of the other nearby antenna masts we have a 440 Mhz Station Master antenna; this mast is a 75 foot pine tree. In the past this antenna has served as a secondary 440 repeater site. It is currently earmarked for a future remote base. The antenna is fed with 7/8" coax. Our packet system resides at the Castle Rock site. The system is an AX.25 system which serves as a BBS, a digipeater, and a KA-node. It uses an AEA Isopole mounted on the shack roof. There are two equipment racks in this photo (above right). 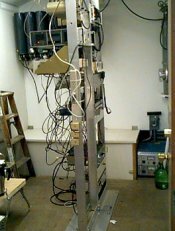 The foreground rack contains our NOS TCP/IP packet station and a member's experimental 1.2GHz repeater. The background rack has the 2m, 1.25m, and AX.25 packet stations, along with a patch panel that combines functions among the various repeaters. Our second site is atop Black Mountain approximately 12 miles north of Castle Rock, south of Palo Alto. Las Cumbres shares this site with WW6HP/R, K6BAM/R and commercial radio services. This provides us with an excellent 440Mhz site. The tower (photo at left) used to sprout from the peak of Black Mountain within the Skyline Open Space Preserve at approximately 2800 feet. The winter of 97/98 brought wet and windy El Nino weather patterns to the area. Wind collapsed the former unguyed tower into an upside-down "U". You can follow the black cabling, starting at the right side of this picture: up (behind the red and white tower), then left, then down. This took K6FB 440 off the air in January '98. Monumental efforts, in perfectly nasty weather conditions, restored commercial services by January's end, followed by amateur services in mid-February '98. In the following months a new site/tower was identified (very close to the former site) and most of the commercial and amateur repeaters relocated. This former site was razed and returned to nature. The Black Mountain sites have an excellent view of the whole San Francisco Bay area. Jey knows: that's him on the temporary tower at right checking the view and working on the antennas. K6FB's repeater input and output antenna is photogenically posed above his left hand. The RF footprint of 70cm reaches into the nooks and crannies of north San Francisco Bay communities and even into the "Wine Country" counties in places. The south bay and peninsula coastal waters are exceptionally well served, too. This antenna is energized by a Vertex commercial radio for repeater transmit and receive duties to the outside world. The club purchased and installed this radio in the Winter of '96/97. This site is linked to Castle Rock by a companion Vertex commercial UHF radio. This was purchased and installed in Spring '97. It replaced our aging and troublesome Motorola Micor links. The link radios use a pair of small Yagis (not shown) to link back to Las Cumbres. The pair of Vertex rigs has proven to be extremely reliable and problem-free. Even the installation was painless!